Yesterday in my post I mentioned that I really loved the bracelet that I was wearing with my "Warhol Top", well today I am going to show you just how to make it. I had hoped to make a video on top of some step by step photos, but I had a migraine yesterday and it kind of killed that idea. Hopefully the photos will do. The bracelets are super simple to make, but maybe not so simple to explain. I'll do my best. After making my Yoga pants and my Warhol Top I was left with several half-shirts and strips of fabric. I couldn't bring myself to throw them away so I held onto them knowing that I could make something wonderful out of them (originally I figured a headband-shocking I know), and I did-these simple braided bracelets. I have been assisting our girl's camp director in making friendship bracelets for our upcoming girl's camp-so it was fresh on my mind. I sat down and was chatting with my husband and fiddling around with a scrap of knit fabric from my yoga paints when this little dandy emerged. Now let's dive right in. Cut your fabric: For the white bracelet that you will see I used three strips of 1"wide (this can be increased or decreased to vary the width of bracelet) fabric that was cut 69" long if you have small wrists your pieces of fabric could be shorter, but I'd try to have pieces that are at least 55" in length. Fold your fabric in half lengthwise. 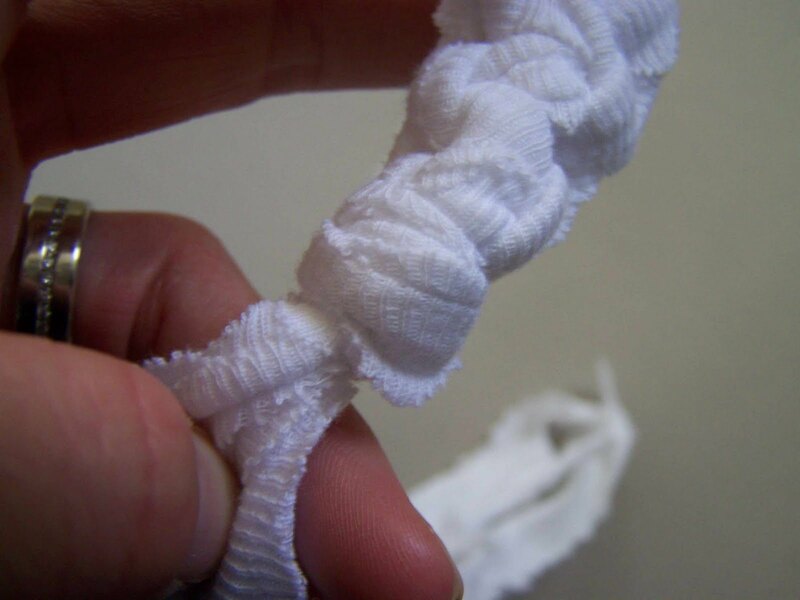 You are going to find the center of your strips of fabric and you will tie a knot about an inch down from the center of your strips of fabric. 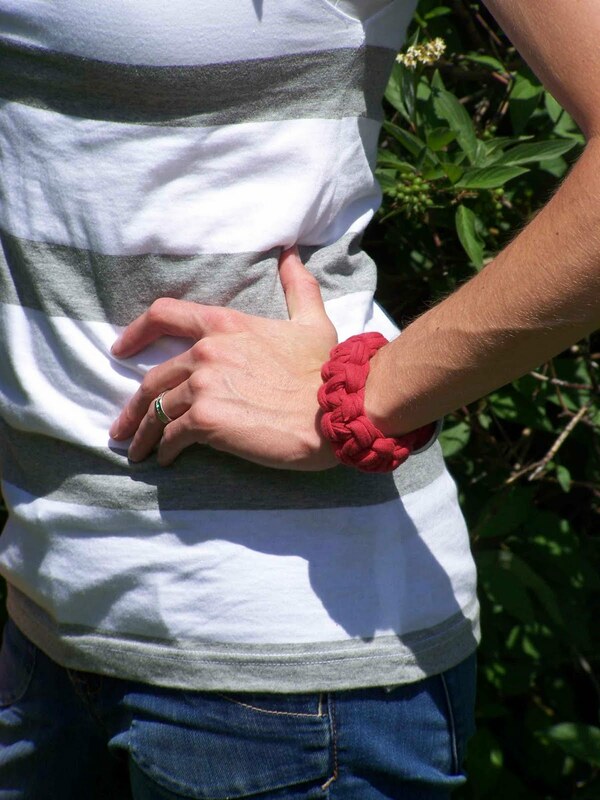 This loop that is created by the knot is going to be the loop for your button closure. You will no have 6 strands of equal length fabric. For the tutorial I've used Red, Yellow, and blue fabrics so you can clearly see which strands I am using-don't worry I will not be wearing this bracelet. 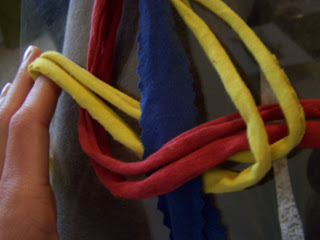 Braiding Step 1: Divide your 6 strands of fabric into three sections. You will have a middle section that will act as the center of your braid (blue) and two strands on each side that you will use to form your knots. Take the two strands on the left hand side (red) of your bracelet and create a loop by placing your strands across (on top) of your center strands (blue). It should look somewhat like a number 9. 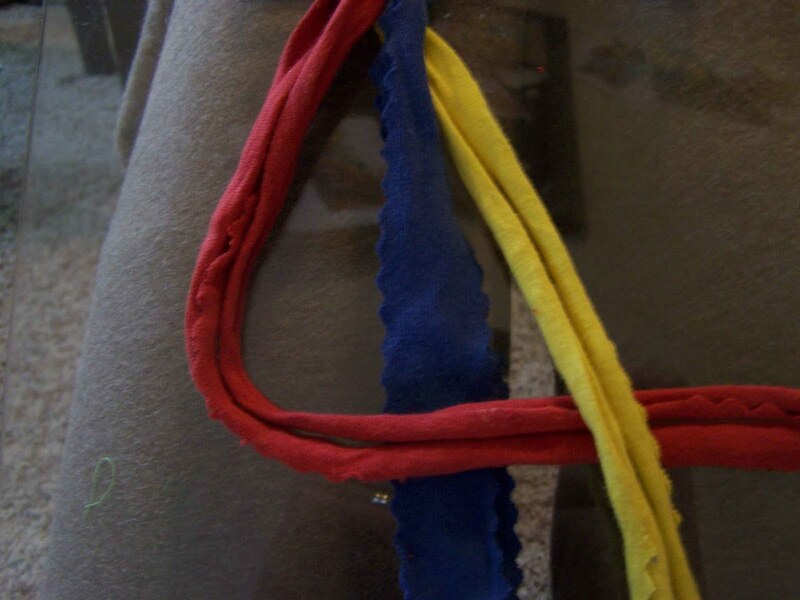 Braiding Step 2: Take the two strands of fabric on the right hand side(yellow) and place them on top of the tail end of your (red) left hand strands. Now move your right hand strands (yellow) under the center strand and through the loop that you created with your left hand (red) strand. 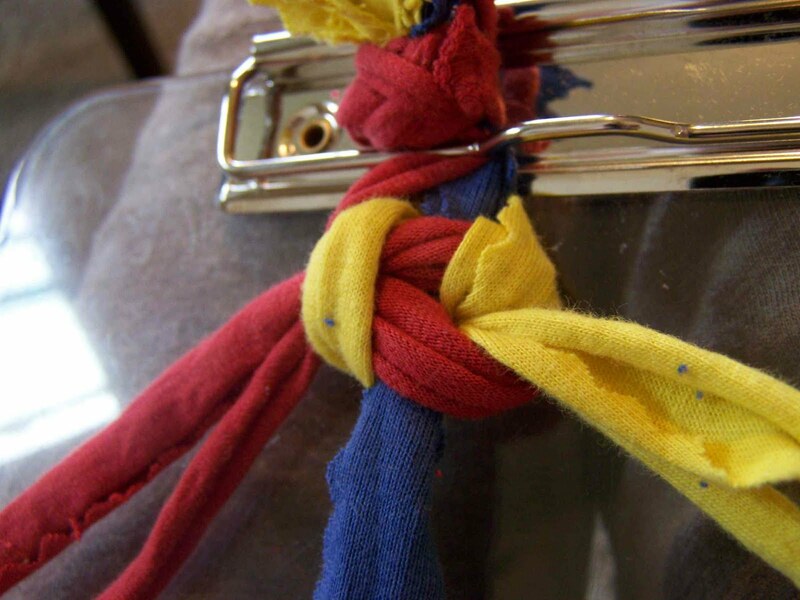 Pull both the right and left hand strands tight to create your first knot. Braiding Step 3: Step 3 and 4 are going to be the opposite of one and two. 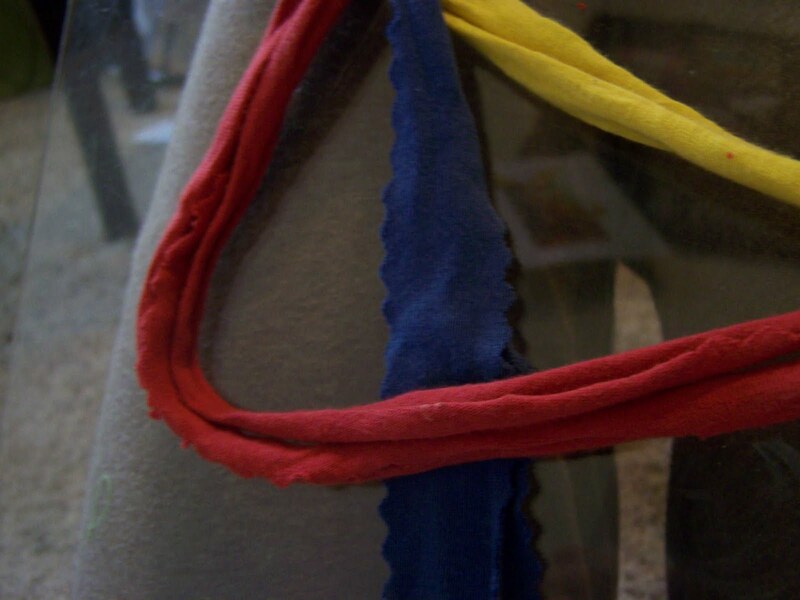 We will start by taking our right hand strand (red) and crossing it's tail end over the top of the center strand, creating a loop on the right hand side of our center strands. 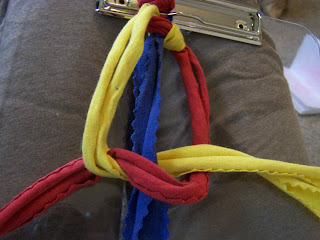 It should look like a letter P.
Braiding Step 4: Take your left hand strands and place them on top of the tail end of the right hand strands and move them under the center strands and up through the loop on the right hand side. Pull tight. 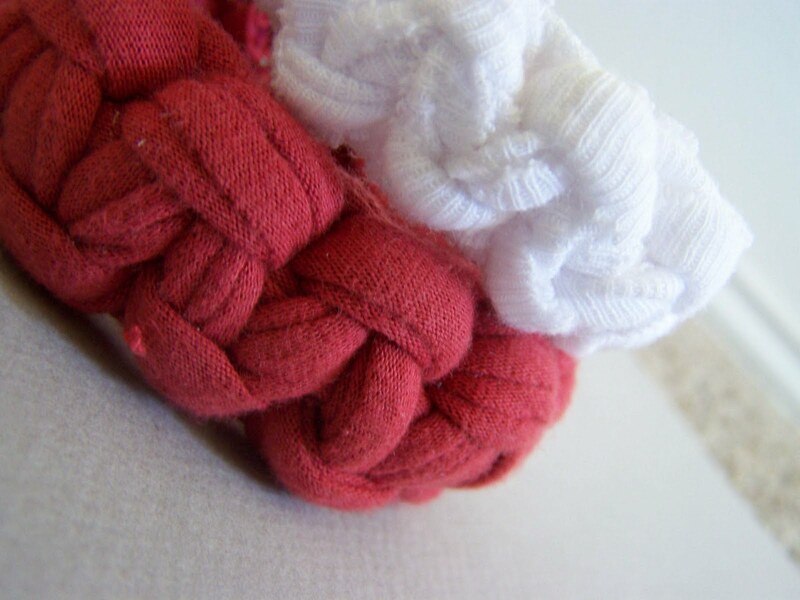 You've just created the four basic steps for the bracelet. Repeat braiding steps 1-4 until desired bracelet length is reached. When your bracelet is the correct length you will want to tie a simple knot to the end, pull it tight, and trim the ends of your strings. 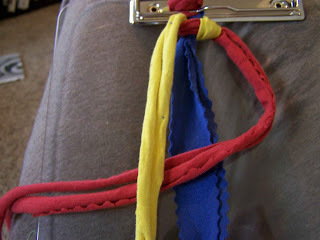 Now that we have our bracelet braided we are going to attach a covered button. This is a super simple process, and I don't mean to insult anyone's intelligence, but I thought I'd show some basic steps to remove any fears that might be out there. To cover a button this is what we need to do. Gather your materials. You can buy a kit at any craft store or craft department. This kit cost just over a dollar for 4 buttons. 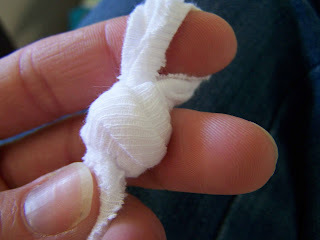 You will need your kit which includes the needed tools, and a scrap of fabric that is slightly larger than your button. Place the scrap of fabric in the indentation of the white button covering tool. Place the domed shell of your button directly on top of the scrap of fabric. Tuck in the edges of your fabric so that they are all pointed toward the center of the button. 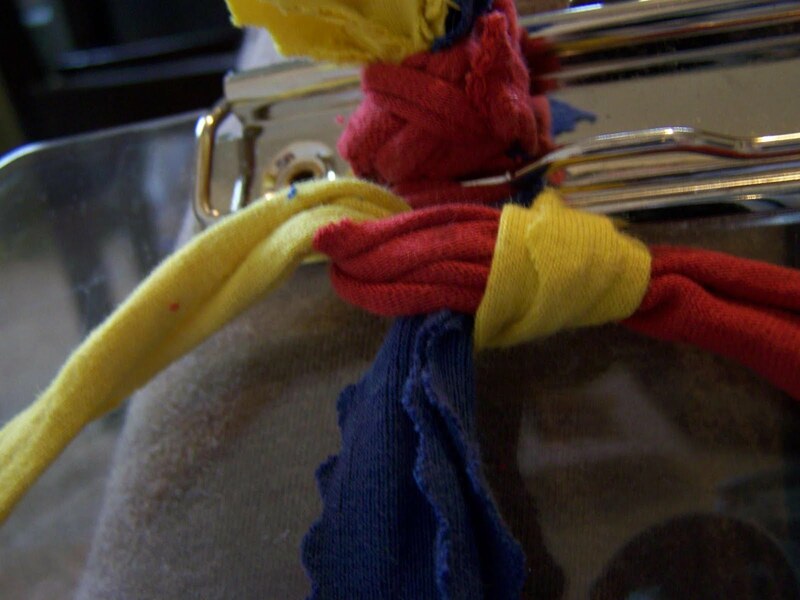 Place the back of the button on top of the fabric and front of the button. Make sure that you can't see any raw edges of your fabric. 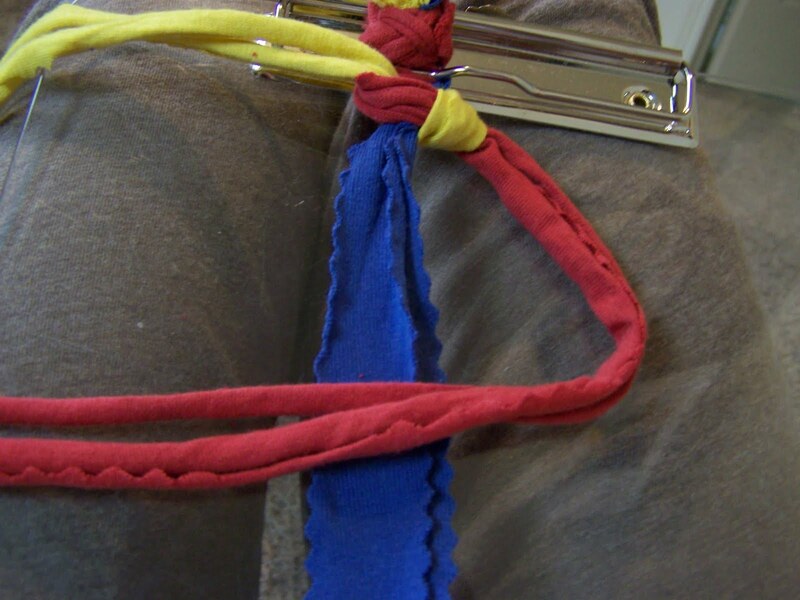 Take your blue push tool and place it on top of the backside of the button. Firmly press down and secure your button. That's it-you have a beautifully covered button. Now it is time to attach the button. 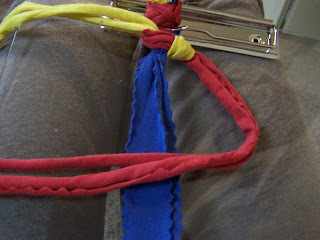 I use a doubled thread and tie the button directly onto the knotted end of the bracelet (not the loop end). Don't worry I am not going to show you how to sew on a button. Do secure the button several times so that it doesn't pull loose. 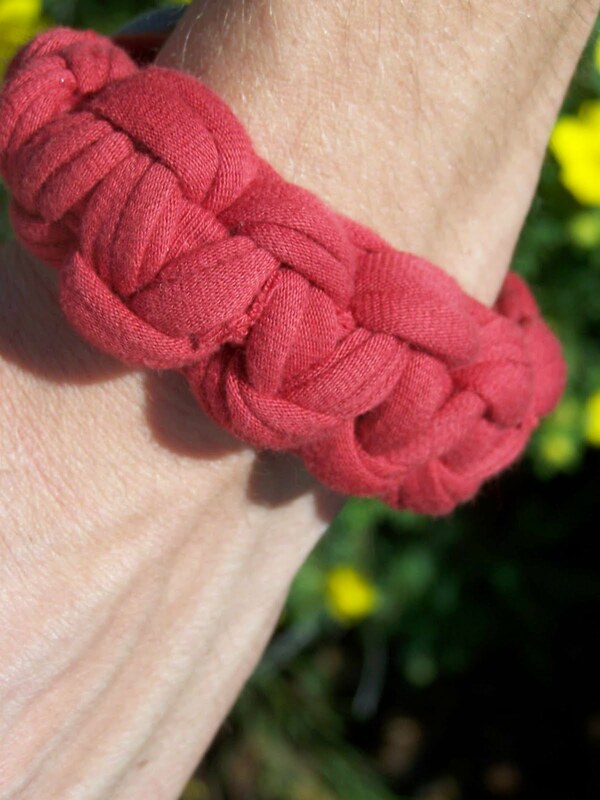 You now have a beautiful braided bracelet, and better still you used up your scraps of knit (and no sewing required). 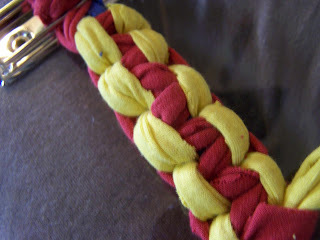 You can make variations to this bracelet by alternating colors of looping fabric, or using multiple colors as in the example (but please don't use yellow and red). By the Way-I'm planning a post on how to sew with knit fabrics, if you have any helpful tips that I should share please let me know. p.s. I found you on Life in the Pitts! I am so headed to my stash right now while the kids are asleep! 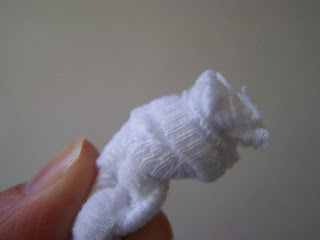 Fantastic :) I'm looking forward to your post on how to sew knits. I have several cuts of jersey in my stash that I need to do something with! Those are addorable! The girls would love them!! They are going to be so jealous of clarky when they finally realize they got a very uncrafty mom ans clark got a very very crafty one! This is great! I'm going to have to try it! Thanks for sharing! So cute! thanks for linking up. Thanks for the tutorial, I had forgotten how to do that type of braiding!!! really really cute! these would be so fun to make with the young women in my church. thanks for sharing!! Ooh, I'm glad you did a tutorial on the knotting. I always forget how to do this. I love this bracelet and your tut is so easy to follow! Thanks for the project!